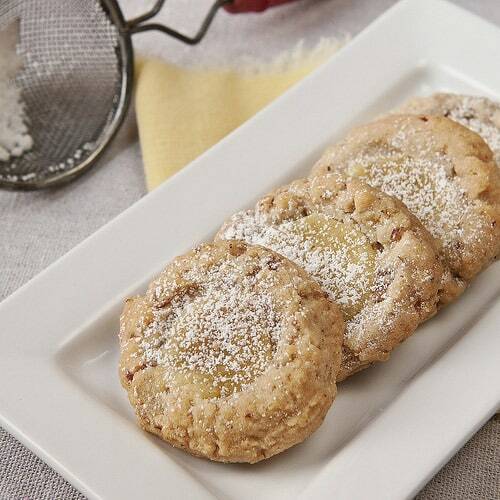 Lemon-Pecan Thumbprint Cookies are a traditional jelly thumbprint cookie after a slight makeover featuring a lemon curd filling in a pecan-studded cookie. Sprinkle with powdered sugar for a dressier look. My hand unexpectedly volunteered to host a get-together for my Bible Study Fellowship group last week. It was the motivation I needed to finish decorating my house for Christmas. But I was feeling lazy and incompetent about doing my tree. It’s not terribly big or fancy–I just wasn’t in the mood, and I don’t usually think it looks all that good when I’m finished. Then Superman Rob came to the rescue. My daughter-in-law’s brother does a fabulous job decorating homes (interiors only) for Christmas. Part of our deal was the promise of a lemony treat. For this reason, I set to work on these Lemon Pecan Thumbprint Cookies. 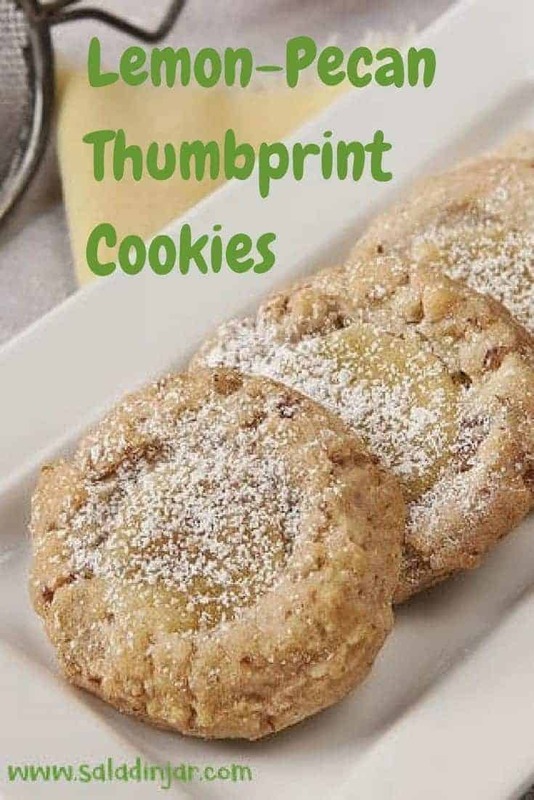 They are a variation of my husband’s favorite Christmas Thumbprint Cookies. I mixed the pecans into the dough instead of coating the cookie (to save time), used lemon curd instead of frosting in the center, and sprinkled the finished cookies with powdered sugar..
Toasting nuts makes a difference. Skip it and miss out on the best flavor. It only takes 2 minutes with a microwave–directions here. Lemon curd can be homemade or store-bought. Here is my recipe for making it in the microwave. Want something different? Try making orange or lime curd for a unique variation. Putting the cookies in the oven for a couple minutes before making a crater helps soften the dough so you won’t have cracks around the edge that leak filling. No guarantees–you may still get a few–but it works for me. Be sure cookies are completely cooled before dusting with powdered sugar or it will melt and disappear. The traditional jelly thumbprint cookie gets a slight makeover with a lemon curd filling in a pecan studded cookie. Preheat oven to 350 degrees. Place flour, toasted pecans and salt in bowl of food processor and pulse until nuts are finely chopped. Use electric mixer to combine butter and sugar, beating until light-colored and fluffy. Add egg yolk and vanilla, mixing well. Pour flour mixture in all at once and gently combine just until flour disappears. Scrape bowl a couple times to be sure there are no chunks or streaks of butter left unmixed. Roll dough into tablespoon-size balls and place on cookie sheet covered with parchment paper or silicone baking mat. (If dough is too soft to handle, chill for about 30 minutes.) Bake for 2 minutes. Remove tray and use your thumb or a rounded teaspoon to make indentation in each cookie. Bake another 8-9 minutes and remove cookies from the oven. Working quickly, re-indent center with thumb or spoon and fill with a half-teaspoon of lemon curd. Return to the oven another 8-10 minutes until cookies start to brown on the edges. Allow cookies to cool about 5 minutes then remove to cooling rack. When completely cool, sprinkle with powdered sugar. I made these with freshly ground whole wheat flour. They are very good! I can’t stop staring at these cookies. Great looking cookies. Now I know how that extra jar of lemon curd in the pantry will be used for Christmas baking. Sounds delicious and I agree with Scooter-I love lemon and am sure they are a welcome change to everything chocolate- although I love that too. Will have to try these for the holidays! I made these for a cookie exchange and was a little afraid because not everyone likes lemon the way I do. I think folks were so tired of chocolate that these were among the first to go. I will definitely make them again. I also want to put Rob on my speed dial. mmm…I know these would be one of my favorite since I really like lemon curd. Great food styling. Lucky decorator! These look soooo…. good! Girl, you KNOW that you had me at lemon! These cookies are so pretty! I just made thumbprints cookies myself and love that you have posted a new and great recipe to an old favourite! Sounds as if everyone came out on top of this cookie-tree decorating swap! These sound so delicious! Thanks for all the very useful tips at the end! Your decorator thinks these cookies are AWESOME!!!!! I did have to share. I can’t wait to try these. Thumbprints are a favorite around here, but I think they’re a pain to make because there are so many steps, coating them with nuts (first, the egg whites, then the ground nuts . . .) My son read your recipe over my shoulder and said, go for it! I wanted to post a picture of my tree but couldn’t get a picture to do it justice. You two have the magical touch when it comes to Christmas decorating. I can’t wait to see the tree! Rob said these were delicious! Well, I can’t steal these from your freezer, but I can steal the recipe, right? Thank you…anything lemon has my attention immediately. Anything that look this good in a photo also have my immediate attention. Looking forward to making and eating these! Of course you can steal the recipe, Kayte. If your family likes lemon, they will love these.